Hey guys and welcome back to my home decor series! 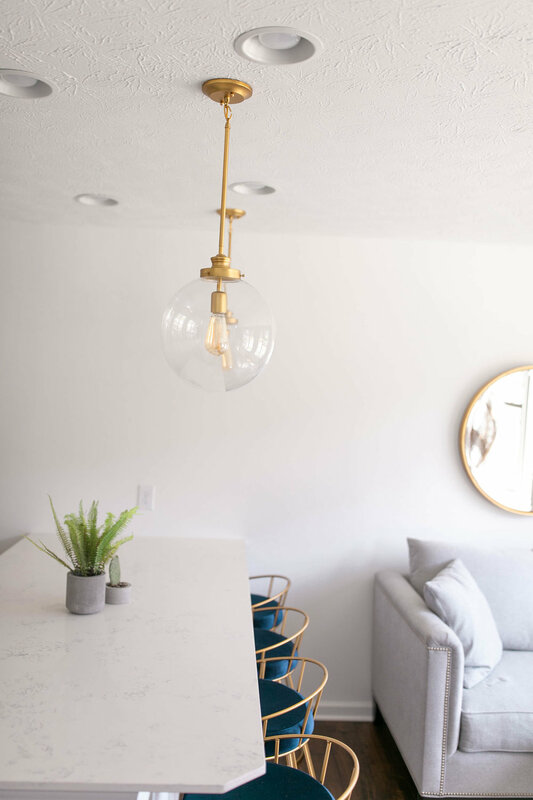 Today I’ll be sharing our light fixtures and a few before and after photos. As most of you know, we purchased our house in January while it was being built. With it being a new construction, we were able to be part of the customization process. Unfortunately when it came to picking light fixtures, our options were pretty limited. I didn’t love any of the lighting options that were given to us, so we decided to just go with the standard option when necessary, and cap the rest (knowing that we would install our own once we moved in). Keep in mind that Cort and I are not the most handy people… This is one of the reasons we bought a new construction (no fixer-uppers here). I’m happy (and proud) to say that after a few trips to Lowe’s, we were able to install our light fixtures with our own four hands! We ordered our fixtures online from Build.com and we stuck to the Progress Lighting family. and I was beyond happy with the quality of the fixtures and the finished look. It took us a couple YouTube videos to figure out how to install the first fixture, but after that first one, it was smooth sailing. Let’s start with the pendant globe lights that we installed in our kitchen and downstairs bar. We decided to do the same lights in both of these locations to have a little bit of consistency in our house. All of the hardware in our kitchen and downstairs bar is silver. I tend to decorate with a lot of golds and I love to mix metals, so I went with a “natural brass” color for these fixtures. They’re simple, yet very eye-catching and I absolutely LOVE them. They completely transformed the space as there was nothing there before. Above our kitchen table, we installed this amazing sputnik chandelier. 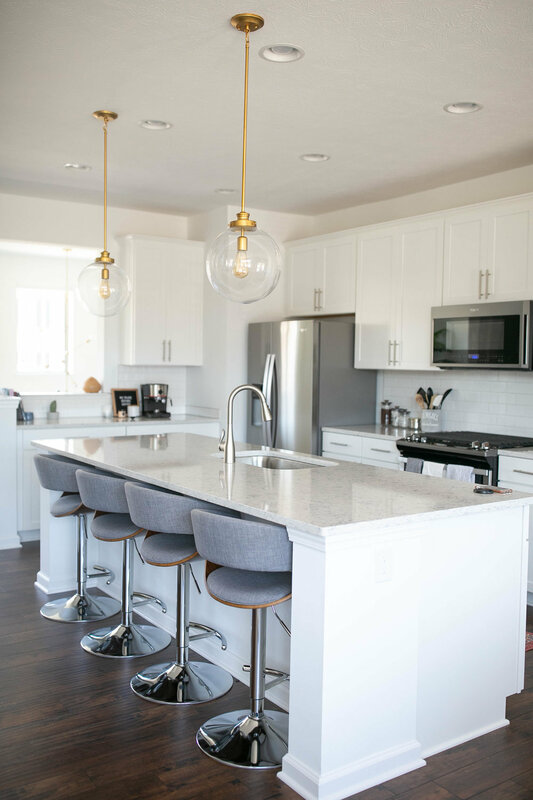 It’s definitely more funky and makes a big statement, but because our pendants above our kitchen island were more subdued, I felt like this would be perfect. The color of this chandelier is “brushed bronze” but honestly, the color looks the exact same as the “natural brass” pendants. The chandelier that came standard with the home was quite ugly in my opinion, so this was a major upgrade! For our bedroom and bathroom fixtures, we decided to switch it up and go with silver fixtures. We installed another sputnik chandelier above our bed in the color “brushed nickel”. I love this fixture so much but I think it’s a little small for our master. This chandelier comes in two sizes, so I’m thinking of moving this one into my office and then buying the larger size for above our bed. We have vaulted ceilings in our master, so I think a bigger chandelier will help fill out the space. Regardless, it still looks way better than having nothing above our bed and I love the dimension that it adds to our room. The fixture that came with our bathroom looked like the fixtures that were in my parents’ home that they built in 2001. We ditched it pretty quickly and upgraded to a much more modern fixture. I love the clear, spherical shades and simplistic design. If you want to add some pizazz to your house, I highly recommend switching out your light fixtures. It’s such a small change but I feel like it makes a HUGE difference, with pretty minimal effort. 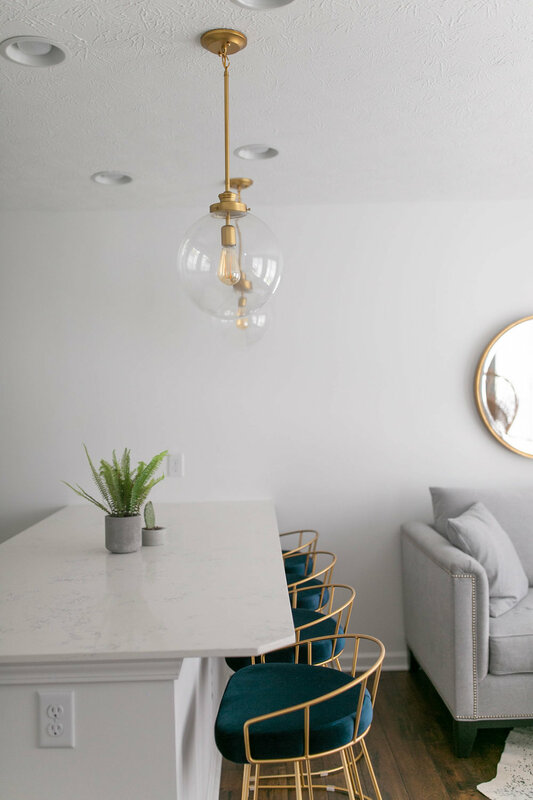 We have a couple other fixtures in our house that we’d like to change, such as our guest bedroom and guest bathrooms, and my office, but I feel like we have made a big dent so far! You can see some videos of our installation process on my “house stuff” Instastories highlight.